Geosynthetic clay liners (GCLs) combine geosynthetics with sodium bentonite clay to form a highly impermeable barrier that often replaces thick layers of expensive compacted clay. GSE offers two different products, a GEOMEMBRANE SUPPORTED GCL and a FABRIC ENCASED GCL, both of which deliver reduced cost and increased performance even in the most demanding environments. 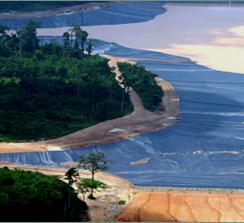 GSE GundSeal Geomembrane Supported geosynthetic clay liners provide the best leak protection available in the market. Our product combines an HDPE or LLDPE geomembrane in a smooth or textured surface with the swelling and sealing ability of sodium bentonite. GSE GundSeal can be used as a one-product composite liner (geomembrane/clay) that can replace either a compacted clay liner or a geomembrane/compacted clay composite system in many environmental applications. What makes GSE BentoLiner unique among geosynthetic clay liners is that it incorporates a woven geotextile for dimensional stability, and is reinforced for increased internal shear strength. GSE BentoLiner offers an array of different features and application usages for low to high loads and flat to steep slope in landfills, mining, and pond projects.